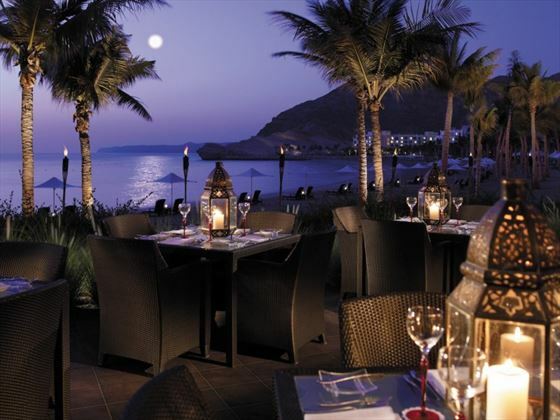 Shangri-La Barr Al Jissah Resort & Spa Al Bandar, Oman. Book at Tropical Sky. 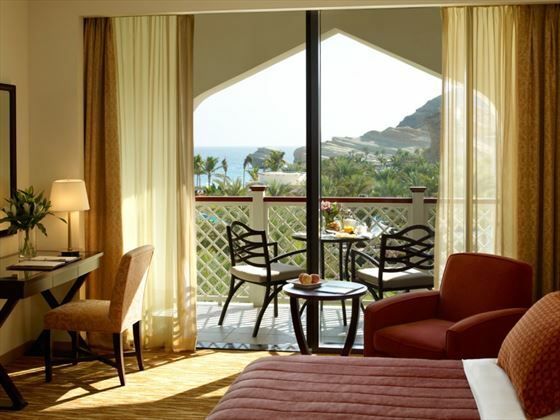 Found in the middle of the luxurious Shangri-La Barr Al Jissah Resort and Spa, Al Bandar is an elegant hotel sitting on 124 acres of white sand and surrounded by towering date palm trees. 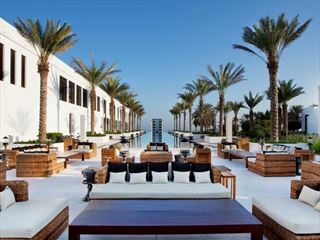 With its name meaning ‘The Town’, this fantastic hotel is the focal point of the resort, and home to a wide range of delicious eateries, a sparkling pool, and the spectacular Barr Al Jissah ballroom. We love the hotel’s grand architecture. Inspired by old Muscat, each building is of an impressive structure, with authentic ornate balconies and jagged roofs. 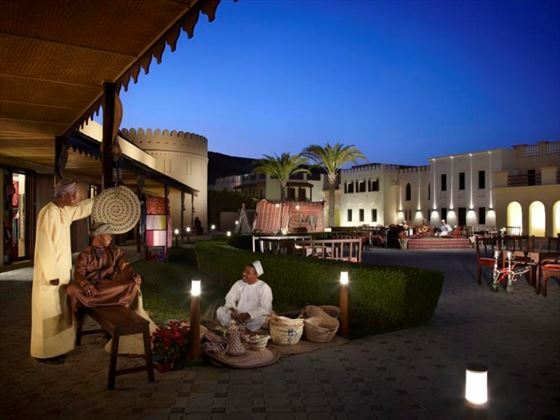 The beautiful buildings are also close to the resort’s excellent facilities, including the vibrant Arabic marketplace Al Masaak Souk, and the Omani Heritage Village, whilst its lovely 198 rooms face the glistening water of the Gulf of Oman. Children will love the family-friendly facilities close by to the hotel. From wall climbing in the Adventure Zone and Henna Painting in the Cool Zone, to floating in an inflatable rubber ring along the Lazy River, there’ll be plenty to keep younger guests occupied. Meanwhile, meander along to the adult-only CHI, The Spa for a full range of revitalising treatments and amenities. 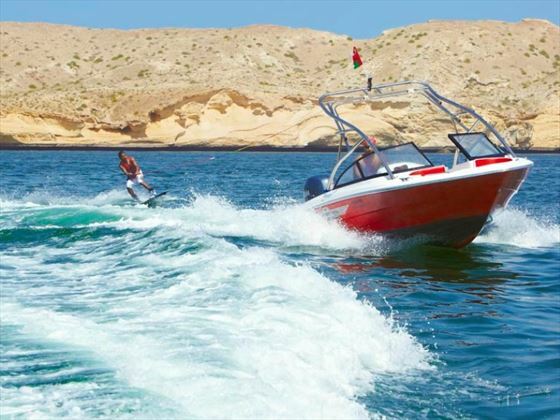 WiFi is available throughout the resort, and with plenty of international restaurants, complimentary non-motorised water sports and beautiful ocean views, Al Bandar will be the perfect place to relax and have fun. The Shangri-La Barr Al Jissah resort is also home to Oman's first dedicated family hotel Al Waha, and the opulent 5* Al Husn. A part of the extravagant Shangri-La Barr Al Jissah Resort & Spa, this luxurious hotel sits within 124 acres of beautiful beaches and mountainous desert backdrops along the bay of Barr Al Jissah in Oman. Known as ‘The Town’, Al Bandar’s magnificent architecture can be found in the middle of the luxury resort, standing as its marvellous focal point. Al Bandar’s structure is inspired by old Muscat buildings, with the city of Muscat only a half an hour drive from the resort, offering beautiful desert mountains and the sparkling Muscat Harbour. Bait Al Zubair, a fascinating museum with a breath-taking selection of Omani artefacts, is only a half hour drive, too. The hotel has daily complimentary shuttle buses for Mutrah. 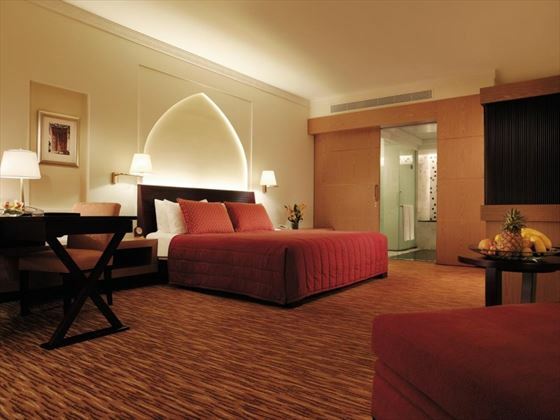 Deluxe – Lovely 38sqm rooms with Arabian style décor, overlooking the resort garden from the furnished balcony. Sleeps a maximum of three adults or two adults and one child. Deluxe Terrace – Modern 38sqm rooms with a spacious terrace with direct access to the gardens and pool areas. Sleeps a maximum of three adults or two adults and one child. 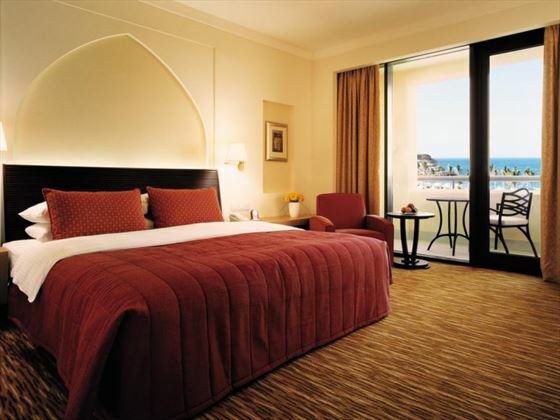 Deluxe Sea View – Contemporary 38sqm rooms with a furnished balcony or patio overlooking the sea facing gardens. Sleeps a maximum of three adults or two adults and one child. 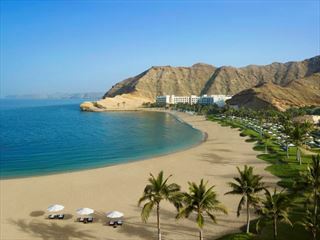 Premier – Some of the largest non-suite rooms in Oman, offering 51sqm of luxurious décor and views of the Gulf of Oman. Sleeps a maximum of three adults, or two adults and two children. One Bedroom Suite – Large, opulent 76sqm suites with a separate sitting room featuring a DVD entertainment centre and flat screen TV, plus a large ocean view balcony or patio. Sleeps a maximum of three adults or two adults and two children. Speciality Suite – Stylish suites with 114sqm of space, including a very large balcony, a separate sitting and dining room, plus a DVD entertainment centre and flat screen TV. Sleeps a maximum of three adults or two adults and two children. 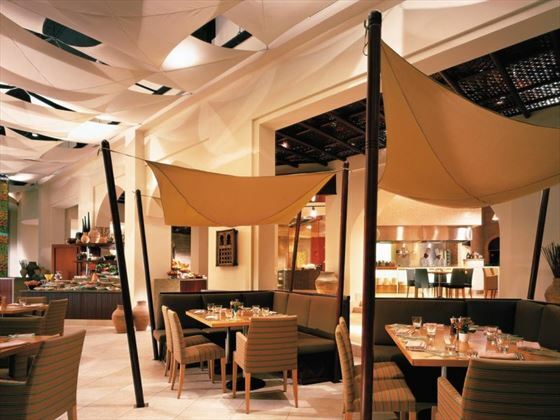 Al Bandar hotel has the most restaurants in the resort, so it is the focal point for many guest’s dining options. Guests of Al Bandar also have access to the other eateries around the resort. Al Bandar is a Bed and Breakfast, all lunches and dinners come with an additional charge. Al Tanoor – An authentic Oman experience, with distinct Arabian flavours and traditional tented décor, plus a nightly buffet that changes daily. Open 6.30am till 11am, 12pm till 3pm and 6.30pm till 11pm. Smart casual dress code and located in Al Bandar. Capri Court – A trendy outdoor seating area looking out to sea and offering Italian favourites. Open from 7pm to 11.30pm, with a Resort Casual dress code and located in Al Bandar. Tapas & Sablah – Sit on the outdoor decking with fresh Mediterranean and Asian tapas, or Middle Eastern mezze. Open 6pm till 1am with a casual dress code. Located in Al Bandar. Circles – Laid back pool bar offering wood oven pizzas and healthy drinks at the Al Bandar pool. Open from 10am to 7pm with a casual dress code. Piano Lounge – Head here for delicious pre-dinner or late evening cocktails. A grown up bar, so might not be best for young guests. Open 6pm till 2am at Al Bandar, with a smart casual dress code. The Long Bar – Another stylish bar serving signature cocktails. A grown up bar so perhaps not suitable for young children. Located at Al Bandar and open from 6pm to 2am with a smart casual dress code. Bait Al Bahr – Located in between Al Waha and Al Bandar and serving traditional Omani cuisine. Open 7pm till 11.30pm with a Resort Casual dress code. Al Bandar Lobby Lounge – A refined yet laidback lounge serving fine teas and cocktail.s Open 8am till 12.30am with a smart casual dress code. Fairouz – Located at The Heritage Village and offering delicious Lebanese cuisine. Open Tuesday to Saturday from 6.30pm to 1am with a smart casual dress code. Asia – Watch the chefs prepare your dinner in the four glass-enclosed show kitchens. Open Tuesday to Sunday from 5pm till 11pm. Located at The Heritage Village with a Resort Casual dress code. Zafran Café – Tuck in to light meals with indoor and outdoor seating near the children’s facilities. Located at The Heritage Village, open 11am to 7pm, and with a casual dress code. 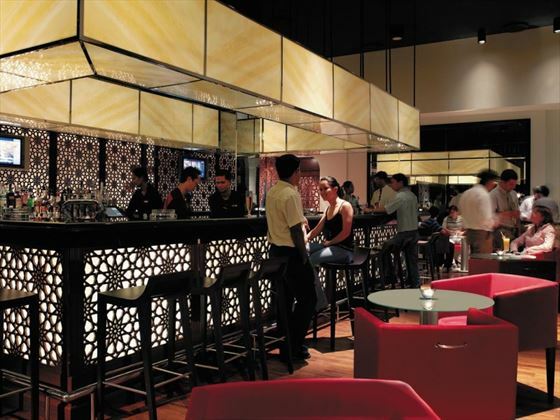 Assira – A laidback bar connected to the Al Waha swimming pool. Open from 10am to 9pm with a casual dress code. Samba – Serving a variety of international cuisines with open show kitchens. Located at the Al Waha hotel, and open for breakfast at 6.30am till 11am, for lunch at 12.30pm till 3pm, and for dinner at 6.30pm till 11pm. Resort casual dress code. Surf Café – A very family friendly restaurant with internet stations and simple dishes. Open 11am till 10pm at Al Waha with a casual dress code. Sultanah - A trendy restaurant with views of the ocean. Located at the Al Husn hotel, and open 6.30am till 11am for breakfast, 12pm till 2.45pm for lunch, and 7pm till 11.30pm for dinner. Restricted to guests over 12 years old, and you will need to make a reservation. Smart casual dress code. 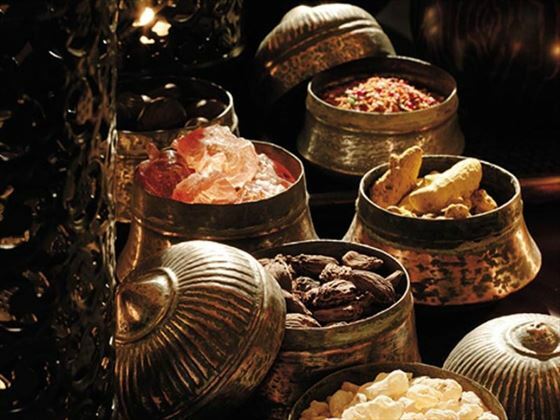 Shahrazad – Authentic Moroccan flavours and decor. Located in Al Husn and open 7pm till 11.30pm. Restricted to guests over 12 years old, and you will need to make a reservation. Smart casual dress code. B.A.B Lounge – A relaxing area for cocktails and canapés, open Saturday to Wednesday from 5pm till 1am, and on Thursday and Friday from 5pm till 2am, and there is a happy hour from 5pm and 7.30pm, with a 25% discount of drinks. Guests must be over 21 after 9pm. Resort casual dress code. 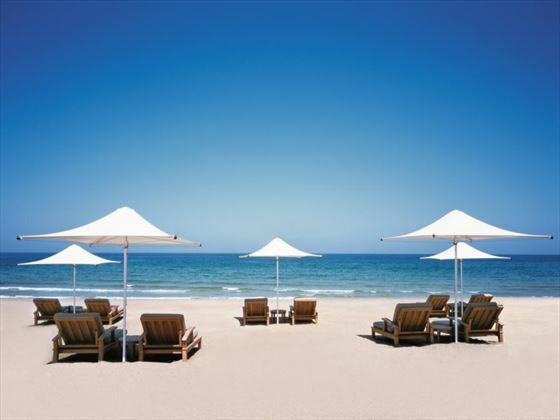 Enjoy the resort’s private 1km stretch of private beach and bask in the sun. The beach also features bathrooms, showers, beach loungers, umbrellas and towels, plus complimentary non-motorised sports. Al Bandar guests have access to two swimming pools in the resort, one next to Al Bandar hotel, then other next to Al Waha. The two pools are connected by Lazy River, a slow, winding rapid that is open from 6am till 8pm. The resort is also close to Turtle Beach, a small oasis at the edge of the mountains. Al Mazaar Souk – Located in the middle of the resort, this is a marketplace with retail stalls, activities and a coffee shop. Omani Heritage Village – A popular tourist attraction, this charming village is full of traditional Sultanate of Oman arts and crafts and artisans working on their expertise. Mini golf – Pick up your complimentary golf putter and balls from the Health Club reception and head to the resort’s lush golf course with nine challenging holes. Open 9am to 9pm. Water sports – Enjoy fantastic water activities at the resort and also at the neighbouring marina, including diving lessons, dolphin watching, a banana ride and snorkelling. Non-motorised water sports are complimentary, whilst motorised water sports have an additional charge. Gymnasium – Open from 6am to 10pm, this state-of-the-art gym offers plenty of fully-equipped cardiovascular and resistance machines. Fitness Centre – Treat yourself to some great facilities, including a sauna, steam room and Jacuzzi. Exercise Activities – Keep up the pace with a few exercise classes, including power yoga, spinning classes, and a circuit workout. For guests over 16 years old only. Pure relaxation can be found at CHI, The Spa, an adult only spa with a variety of modern facilities and rejuvenating treatments. Treat yourself to the fantastic menu of body massages and hydrotherapy, including Vitality Massages and hot stone massages, or simply enjoy the hydro pool, steam room and tropical showers. Open from 10am to 10pm. Up to a maximum of two children under the age of 12 can enjoy complimentary meals from the buffet at the all-day-dining restaurant and meals featured on the placemat menu at the Assira and Circles Pool Bars when accompanied by a paying adult. Extra children under the age of 12 are given a 50% discount. Cool Zone – Great for younger guests up to eight years old, these fun indoor and outdoor, supervised play areas offer lots of great activities, including Henna Painting and a daily movie at midday. Those under the age of four must be accompanied by an adult. Open from 9am to 10pm. Adventure Zone – Located at the Al Mazaar Souk, this thrilling family-friendly entertainment venue offers exciting drop slides, climbing walls and soft play areas. Open from 10am to 7pm, children under the age of four will need to be accompanied by an adult at all times. Children’s pools – There are two small, shallow pools specifically for young guests next to the Circles Pool Bar and the Assira Pool Bar. Both are open from 6am to 8pm. Lazy River – Drift along from the Al Bandar pool to the Al Waha pool on an inflatable rubber ring in this calm, tropical man-made river. Open 9am till 6pm. Splashpad – The whole family will enjoy this entertaining aquatic play area, with light mists and projection jets for a great, family water fight. Open from 9am to 6pm. GameZ – Play a game of snooker, air hockey or electronic darts at this lively venue in the Al Mazaar Souk. Open from 10am until 7pm. Camel and pony rides – Give the kids an activity they’ll never forget with a camel or pony ride from Bait Al Bahr to Al Bandar. Available from 3.30pm till 5.30pm from October to March, and from 4.30pm till 6.30pm from April to September. There is a small additional charge for this excursion. Adult only areas - CHI, The Spa is for adults only, whilst Shahrazad and Sultanah cater for over 12 year olds only, and the B.A.B Lounge is only available to those over 21 years old after 9pm. Alcohol will not be served in Bars, Restaurants and Hotels.Non-Muslim holidaymakers do not have to follow these traditions, however, hotels in Dubai do impose certain restrictions on alcohol, food consumption and entertainment between sunrise and sunset. Please ensure you are aware of these restrictions. 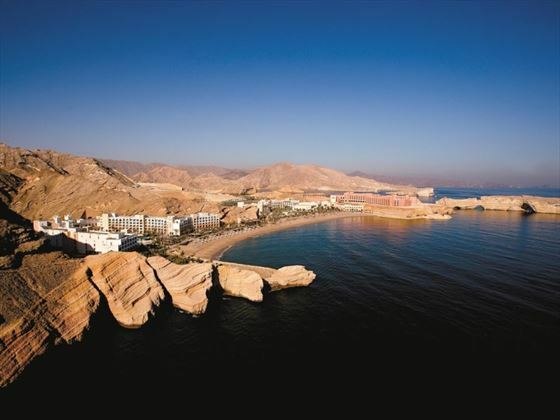 An exceptionally modern stylish hotel built in classical Omani architectural elegance. Simple elegance, stylish furnishings and subtle bursts of vibrant colours create ageless charm in this modern well designed hotel, highly influenced by traditional Omani architecture. Al Waha is a beautiful, Arabian inspired hotel situated in the luxurious paradise of Shangri-La Barr Al Jissah Resort & Spa in Oman. 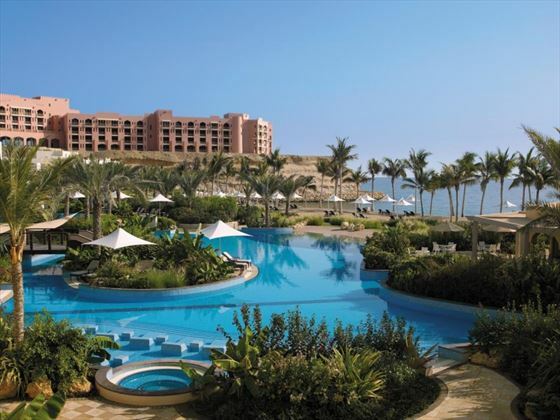 Adorning the resort’s 124 acres of secluded beach, this fabulous hotel is home to a variety of family-friendly activities, as well as an enriching spa and stunning views of the Gulf of Oman. 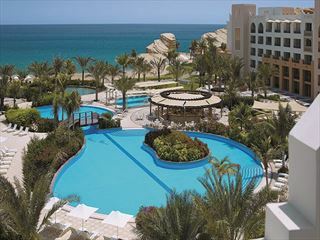 Inspired by Arabian palaces, Shangri-La Al Husn Resort & Spa is a fabulous hotel that will make you feel like royalty. Home to a variety of fine-dining restaurants, exclusive beaches and pools, and incredibly luxurious amenities, Al Husn is a castle-like hotel of pure luxury.